Vanessa Grenier and Maxime Deschamps perform their short program at the 2014 Canadian National Figure Skating Championships in Ottawa, Ontario. Canada’s Vanessa Grenier and Maxime Deschamps won the respect and admiration of many after they captured gold in the Junior division at the 2014 Canadian Figure Skating Championships in their first season together as a team. “We really focused on the performance we wanted to have at Nationals and we made it happen the way we visualized it,” Grenier added. The skaters will kick off their new season as seniors at the 2014 Québec Summer Championships in Montreal the first week of August. 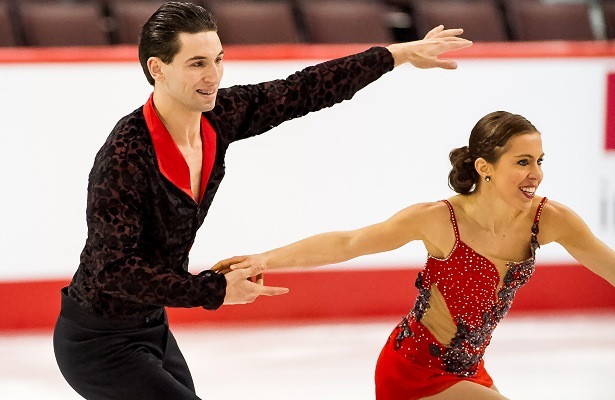 They also plan to compete at the Souvenir Georges-Éthier in September, as well as sectionals in Québec and the Skate Canada Challenge later in the fall. The team is still working with coaches Bruno Marcotte and Richard Gauthier and are also getting a little side help from ice dance coach Sylvie Fullum for detailing. Some of their technical goals include obtaining Level 4 on their lifts, pair spin, and side by side spin. Grenier and Deschamps, both 22, are also debuting a new back outside death spiral and are working to increase the quality of their side by side triple jumps. They would also like keep the grade of execution (GoE) at a “0” for their new triple twist and increase from there. “We’ve been working hard on the throw jumps as well, and would like to see them get +2 GoEs,” Deschamps shared. The skaters, who would like to compete as seniors internationally, are excited about their two new programs, both choreographed by Julie Marcotte (Bruno’s sister), for this season. For the short, they will be skating to a foxtrot remix of Frank Sinatra’s classic Cheek to Cheek. “This style hasn’t been done much in pair skating and we also like the fact that it’s very joyful, just like our personalities,” said Grenier. For the long, they will be performing to music from the movie Somewhere in Time. “We watched the movie to get inspired and we feel like we can relate to the story,” said Grenier. What is key to the skaters is that they will have the opportunity to work more with Julie throughout the season, unlike last year, to develop the program as their elements and skating skills evolve. Last season, they improved at each competition and want to continue that progression this year. They hope to perform on the international circuit in the Senior B events and would like to make the top 5 on the national podium. Grenier and Deschamps also have a coach for side by side jumps on the ice, a team of off-ice gym trainers, dance teachers, and Essentrics teachers. While spending most of the summer training, the skaters just recently took two weeks off to “go out in the nature, see friends and do things” they don’t normally have time to do.